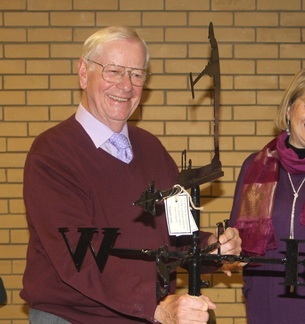 Duncan was presented with a weather vane, depicting him playing croquet, to thank him for 30 years of service to the club. We hoped that it would remind him of happy years at Letchworth when he moves to Norfolk after Christmas. Two teams competed in telling tall tales - some of which turned out to be true! Next Coffee morning Friday 27th January 11am at the club. Hope to see you there. After 18 games at Hunstanton in the Final of the EACF GC Handicap League the score was 9-9 which necessitated a further match to decide the winner. Unfortunately the Reds lost to Stony Stratford but the hoops scored during the day were 104-102! So close! Congratulations to Robert, Tricia, David C., Graham and Tracy for a wonderful season. John Noble, was the clear winner of this year’s CA ALL ENGLAND HANDICAP GC COMPETITION, 17-18 September, Ryde CC. 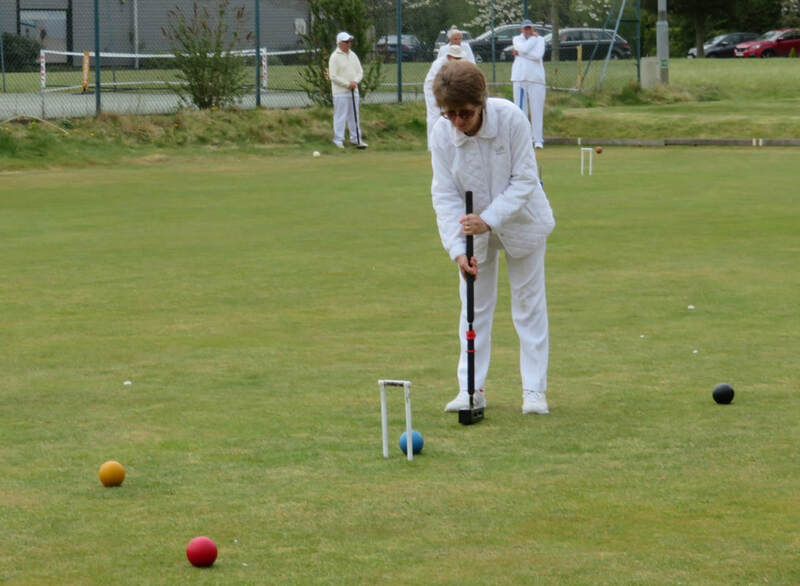 John was one of two runners up from the area semi-finals included in the 14-man all-plays-all final in which he won 11 of his 13 games, two clear of the second place local favourite, Pam Sim. John was the lowest handicapped player, conceding some 55 extra turns to his opponents who ranged in handicap from 1 to 11 (the average was around 4). 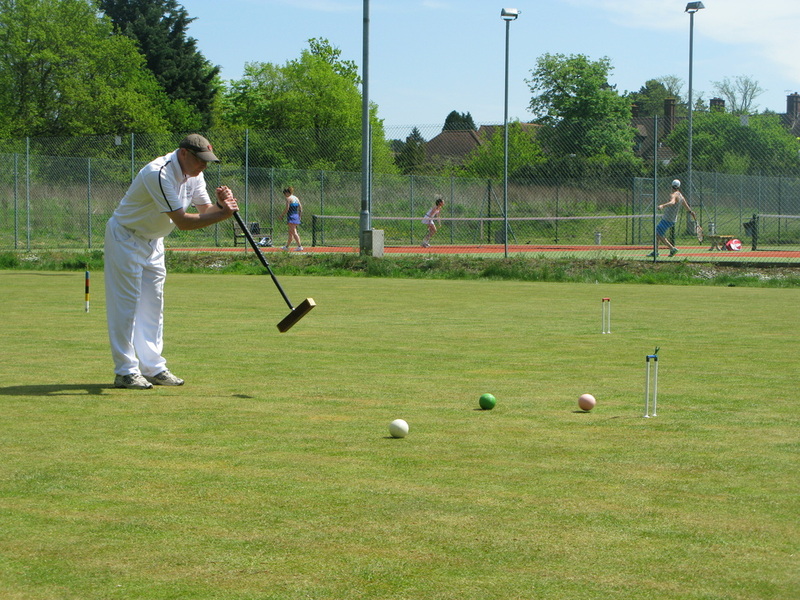 The leader at the end of day one, with 6 from 7 wins, John retained his consistency and form throughout a hot, tiring, Sunday and probably played his best croquet in his final game, a textbook win against the next lowest handicap player, Steve Dennis of Watford CC. John’s handicap is now -1 and he has already made clear he will not enter the competition next year: conceding 68 extra turns is a step too far! 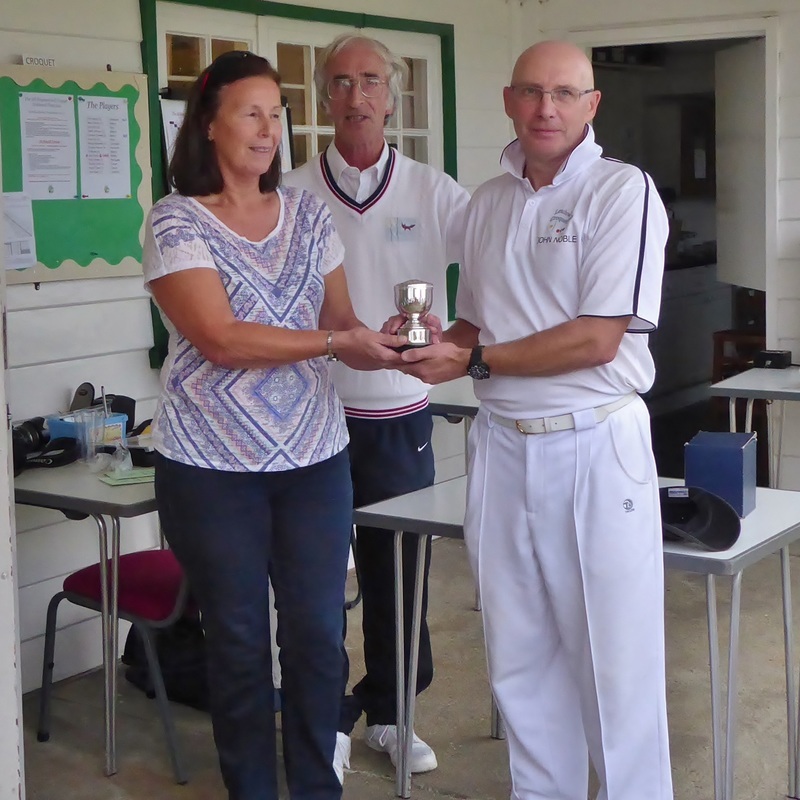 The Trophy was presented on behalf of the CA by the widow of the recently deceased Richard Harris, a popular member of Ryde CC, and the only person to have won the All England Handicap GC Competition twice. Congratulations to the Reds who beat Southchurch Park 13-5 at Colchester on 18th September in the Semi-final of the East Anglia GC Handicap Tournament. They now play in the Final against Stoney Stratford on 2nd October in Hunstanton. Team members on Sunday were David Clancey. Tracy Martin, Trish Noble and Robert Staddon. The day dawned bright and sunny, and all was set for a great finale to this season's club tournaments . . . oops, sorry, I must have jumped ahead to next year's Finals Day; this year it was somewhat different. 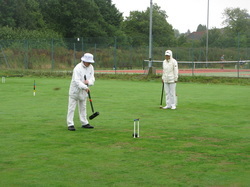 After weeks and weeks of unrelenting sunshine and drought - enough to make a croquet groundsman weep - we had the bad luck of one single day of almost unrelenting drizzle, rain and murk. However, nothing stops a good Finals Day, so off they went - starting at 9:30am and not stopping for anything until the final hoop was run at 4:30pm. And although it was advertised as a non-cake event, you can't keep a good cake-maker down as was evidenced as first Jan & Ray brought a feast of fairy cakes, shortly followed by Beryl & John with their renowned welsh cakes. Others added their offerings to make it more than worthwhile making the effort to support this year's finalists. Congratulations to Duncan Hector who won the Hunstanton A Class trophy in August. 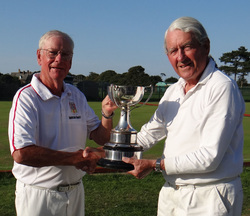 The trophy was presented to him by Hugh Carlisle. 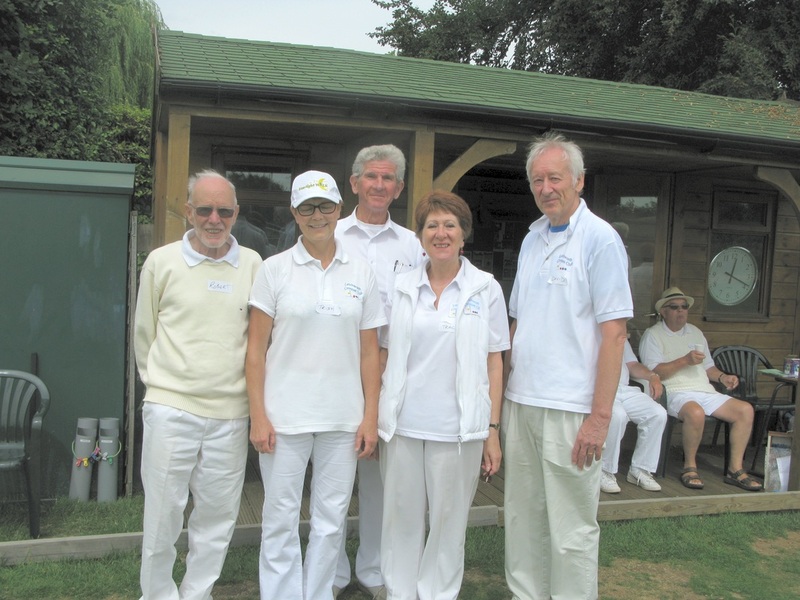 The winning partnership was Ray Scroggins and Tricia Noble. 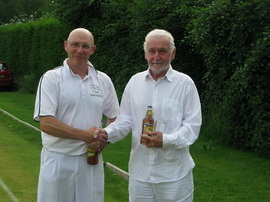 The Highest Individual Score prizes were won by John Noble and Paul Martin. Congratulations to them all. The sun didn't shine but, with a record entry of 32 competitors and a fine array of cakes to sustain us, it was a most enjoyable afternoon. 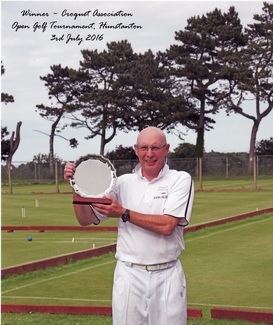 On 3 July, John Noble won all seven of his games to win Hunstanton's inaugural GC Open and take home his first trophy, The Hampson Memorial Shield. Split into two groups of 6 the top two of each group played in semi-finals: John Noble v Simon Carter & David Widdison v Roger Goldring. Interestingly both games finished 7-4. John fought hard to beat Simon Carter, who was on paper the favourite to take the trophy, his superior hoop running proving decisive in the end. The final, watched by a large and appreciative home crowd, turned out to be an interesting and very tense affair with David Widdison building a commanding 4-1 lead. However, seeing the game starting to slip away, John, as in his semi-final, suddenly upped his game and ran home the winner 7-4. Thanks to Sue for hosting our Annual Summer Party in her beautiful garden, to Janet for her brilliant organisation and to Paul for supplying wonderful entertainment with his saxophone playing. Scrumptious food was enjoyed by all. John lost to Desmond Taylor at the 19th hoop in an extremely close final of the CA GC Handicap Tournament held at Letchworth on June 10th. Congratulations to Ann Baker and Paul Martin who won the Fun Doubles and to Beryl Alabaster who had the highest individual score of the afternoon. Thanks to Colin for his impeccable organisation, as usual, and to all the people who baked delicious cakes for us to enjoy! A full complement of 12 played in this year’s Edward Martin GC Singles competition, which started in cool May conditions. 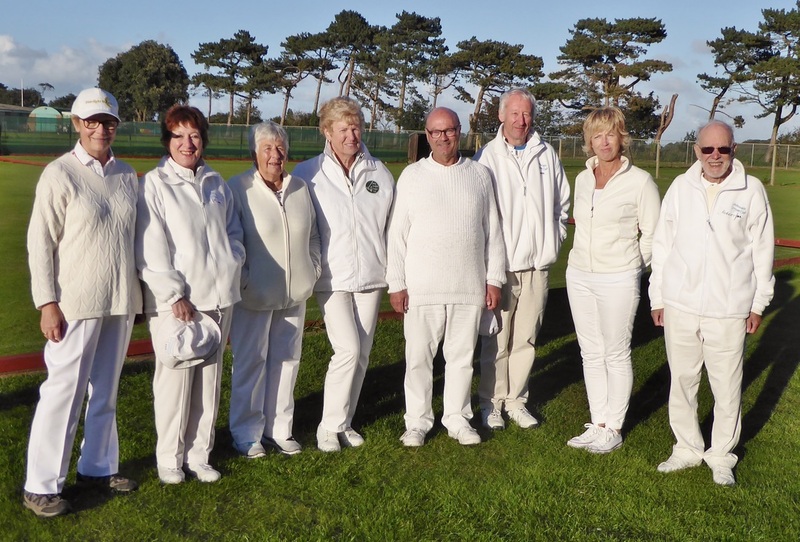 Three groups of four played each other during the morning, which gave us three group winners and the best runner-up to go into the finals, with everyone else playing a Consolation Doubles which was won by Beryl Alabaster and Tracy Martin. But, back to the main event . . . Andy Kennedy, Sue Bathmaker and Sheila Rhodes each won their groups, and were joined by Robert Staddon. Andy beat Sheila and Robert beat Sue, both in close games, to set up a terrific final between Andy and Robert. It was hoop matching hoop all the way round, inevitably going to the golden hoop to decide the match, which was won by Robert Staddon. Congratulations to Robert and thanks to Keith for organising such a successful event once again. See full report of Final Standings under Reports of CA events 2016. Congratulations to the winners, Beryl Alabaster and Susan Brooks and to Sheila Rhodes who had the highest individual score of the afternoon. Having suffered flooding, hail and snow in the first two lessons, course members finally enjoy playing in sunshine. Our Annual Dinner was very successful and well attended as usual.